Most people talk about Peter J. Nygård, Chairman of NYGÅRD (International), in terms of his classic rags-to-riches story – the Finnish immigrants' son, who stitched up an empire out of women's clothing and is now the quintessential self-made man. This story overlooks another side of Peter Nygård – a hard driven man who has created a standard of excellence for the Canadian Women’s Fashion Industry, whose label is the #1 recognized label in the Canadian marketplace, and whose signature is recognized in fashion centres across the globe. Peter Nygård’s success story began when he gathered his life savings and borrowed $8,000 capital to purchase 20% of a women’s garment manufacturer with $800,000 in annual sales, which within a few years he owned outright - renaming it 'NYGÅRD' & turning it around from near bankruptcy into the bustling dynasty that it is today! The speed with which Nygård claimed his #1 position in the industry is attributed to the uniqueness of his business decisions and his work ethic that includes 14-16 hour days/seven days a week. But then again, as Nygård says, "The only time you are working is when you wish you were doing something else". Welcome to the exciting World of Peter Nygård! This is a new release in the ALIA BVI Classic Refresh collection. The weather has turned for the better and now you can live your summer in Capris. These ones are made from a Heather Microfiber Twill, have a pull-on waist and front slash pockets. The hem has a small side slit that's finished with a tab and embellished with silver-tone rivets. Wear yours with a printed top or Gingham shirt and you are ready for any occasion. It was on Friday, December 2, 2005 at a gala dinner party and fashion performance at the Winnipeg Convention Centre when Winnipeg's very own cavalry regiment, the Fort Garry Horse officially acknowledged Peter Nygard for the leadership and service he has exhibited toward the Canadian military by selecting him as Honorary Captain to the renowned Fort Garry Horse Regiment and elected Senator to the Fort Garry Horse Regiment Senate. LCol Sabatier, Commanding Officer of the Fort Garry Horse regiment said "Mr. Nygard, your track record as a supporter of Canada’s serving soldiers and your willingness to share a visible affiliation with one of Winnipeg’s proud Reserve Regiments not only serves as an encouragement to my Regiment’s soldiers, but to the Canadian military as a whole … for the leadership and support you have shown towards the Reserves and our Regiment. We would like to also extend the offer to serve as a Senator and advisor to our Regiment, and future Commanding Officers within our Regiment, as your duties and time allow. Here's a new release in the TANJAY Bright Pink Tulip collection. This light-weight Georgette cardigan has a draped front that billows softly with loose 3/4 sleeves. Wear yours over a simple white Tee for the daytime or over a scoop neck tank top for evening. This cardigan is made of 100% polyester and can be machine washed in cold water. This is a new release in the Peter Nygard Navy Eyelet collections. It's a sharply tailored jacket mixes denim with eyelet lace to bring a soft feminine touch to a classic denim jacket. It has silver tone buttons, flap pockets and a lapel collar. The body is cut from a Stretch Sateen with the front and back yoke over-layered with eyelet fabric. The 3/4 sleeves are cut from unlined eyelet and both the cuffs and peplum are lined with a contrast blue and white stripe fabric. 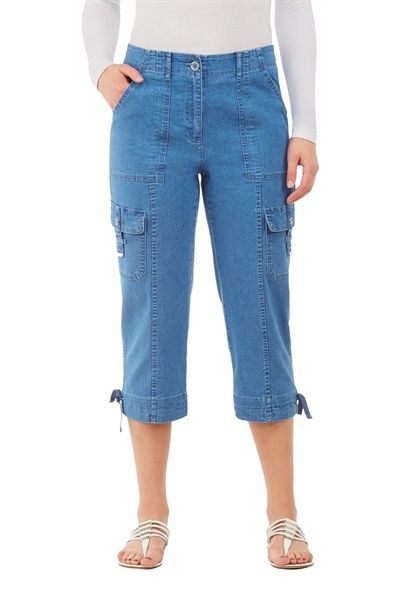 Pair yours with the matching Eyelet Lace Capris or throw on your favourite Nygard Slims jeans and sneakers. This is a new release in the ALIA Cargo Capri collection. 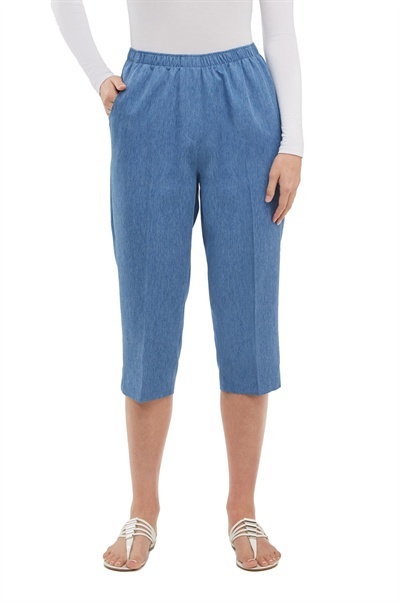 These mid-rise capris are designed to elongate the hip and leg with vertical front and back seams. They have classic front & side cargo pockets but the Stretch Denim fabric keeps the silhouette sleek. They feature a front zip closure and the hems are finished with a twill tie. They are perfect for casual days in the city or at the cottage, so wear yours with a printed Tee and sandals. 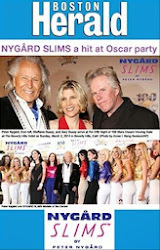 Through the years, NYGARD’s charitable foundation, NYGARD for Life, has encompassed a multitude of endeavors; while the program’s emphasis and commitment has and will remain to be to help eliminate breast cancer, we have broadened it to also incorporate a mandate that improves all aspects of the lives of women. Our sponsorships encompass our annual endowment fund to CancerCare Manitoba. This support allows CancerCare Manitoba to deliver world class researchers to work at the NYGÅRD sponsored Breast Cancer Tumour bank. We have also sponsored a Mobile Mammography Unit that journeys to isolated areas to screen women who might typically not be able to journey to urban centres for mammograms. A function of our donation has members of the Symphony Orchestra playing for breast cancer patients while they get treatment and has delivered thousands of uniquely designed mammography gowns for patients to use during screening. To shine a limelight on the courageous women, NYGARD includes breast cancer survivors as the stars in all of our Fashion Shows. All monies generated through NYGARD for Life specifically has an effect on Breast Cancer survivors and to advance the substantial needed research to discover a cure. As a function of our focus to raise awareness, our fashion shows showcase breast cancer survivors. 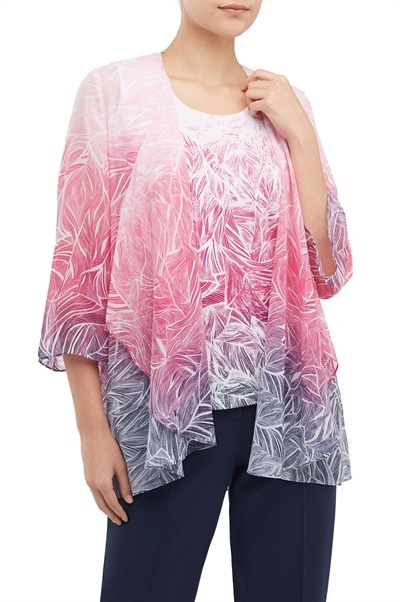 This is a new release in the Bianca Nygard Travel Ready collection. The mixed floral digital print creates a kaleidoscopic pattern. Cut from knitted Viscose, they drape with a sheen finish. The waist has a flat front with two small pleats and is elasticated in the back. The fabric is cut in panels for an elongated silhouette and has side slash pockets. Wear yours with a simple pastel coloured top or go for pattern clash with another print. 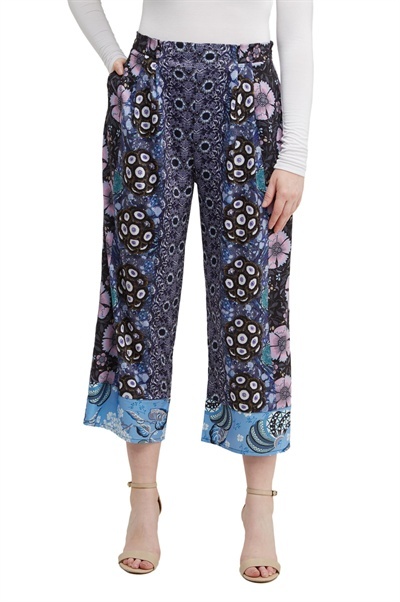 These pants are made of 94% Polyester, 6% Spandex and complete details can be found here. Here's a new release in the Peter Nygard Stripes and Lace collection. 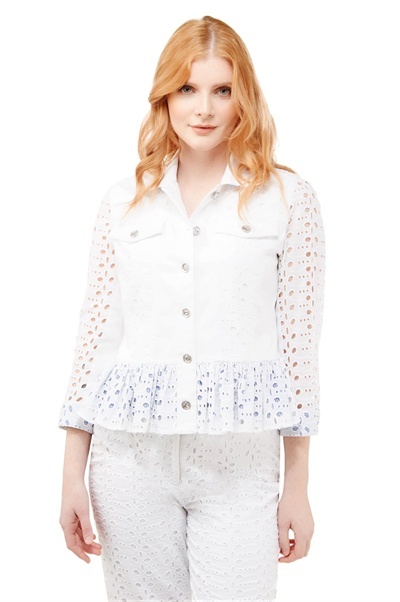 This striking Iconic open-lace jacket is fashionable for daytime or evening. It's trimmed to the waist, has a flat exposed front and 3/4 sleeves. The lace is seamless to disclose skin, a timeless white shirt or a knit chiffon tank, and is trimmed with broad soutache along the neckline, sleeve cuffs and hem. Wear yours together with Nygard Slims jeans and heels for a ultra chic appearance. 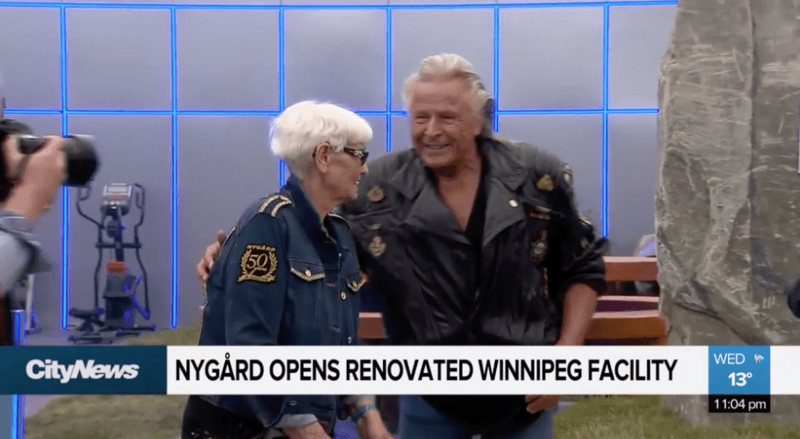 NYGARD International, in keeping with its promise to promote cancer research, on Friday delivered a $100,000 donation to CancerCare Manitoba. NYGARD vice chairman Jim Bennett bestowed the donation to CancerCare Manitoba president and CEO Annitta Stenning, as part of the company’s 50th anniversary celebration function. 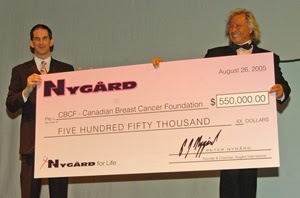 In addition to the monetary donation, NYGARD provided 1500 mammography gowns to the Breast Check and mammography unit at Health Sciences Centre in Winnipeg. The occasion showcased a spectacular fashion show highlighting vintage NYGARD fashions including five decades as the frontrunner in Canadian women’s fashion, and put the limelight on 25 breast cancer survivors on the runway. Guest visitors were provided a special presentation by renowned country music artist Tanya Tucker, as well as a world-class magic act from Las Vegas magician and mentalist Simon Winthrop. Over 1800 guests came to the event, iwhich included 300 VIPs who journeyed from regions around the globe, including Kenya, China, Egypt, Indonesia, Jordan, the United States of America, and Peter Nygard’s home country of Finland.